Gridlines are useful in easy identification of specific box for corresponding row and column. While these are handy for easy data entry and manipulating – they can be annoying while attempting to take neater printout of data displayed in a Google Spreadsheet. However, with feature to hide gridlines you can turn off gridlines display and easily print neat looking spreadsheet file data. 1. Open docs.google.com and login using your Google Account. 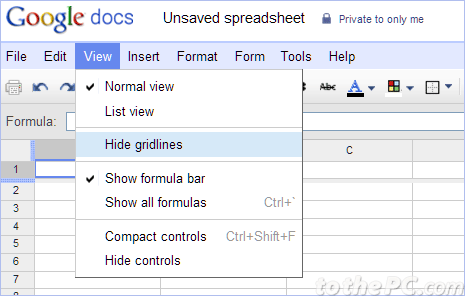 Click Create New > Spreadsheet for new Google Spreadsheet document. Alternatively, you can open any existing Google Spreadsheet file. 2. Enter or type required data in the spreadsheet document file. Then goto View > Hide Gridlines option in top menu. This will hide gridlines in the spreadsheet file.